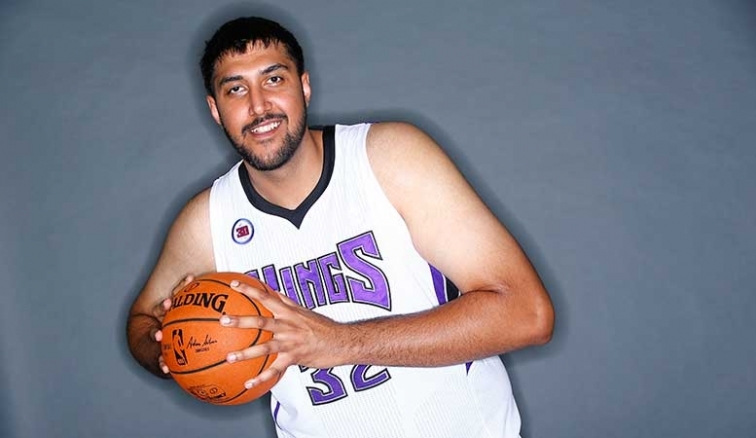 I never really knew how to react to the news that Sim Bhullar would be joining the Sacramento Kings on a 10-day contract. I’m a hoops junkie, so instead of rejoicing that an Indian player made it, my first step was to think of him as a basketball player and I wondered if the Kings really needed him. But the truth is it means way, way more than that. I’ve always been the only Sikh kid since the 6th grade when I moved to Southern California from Canada. I was the only Sikh kid in middle school, high school, and was the only Sikh who graduated from the class of Economics in 2009 at UCLA. I’m the only person with a turban and a beard in my class that’s graduating from UCI later this year. This has often times caused me a lot of anxiety, especially in my formative years in High School. The 9/11 attacks happened in my first week of high school, a strange transition time in any kid’s life in even normal circumstances. While I maintained a brave face and had a great group of peers (for the most part), there were many times where I simply felt I didn’t fit in. I know when I walk into an airport, certain stores, certain cities that people are staring. I don’t have the luxury to look angry, to have a bad day, to blow somebody off. There’s a big difference between me walking into LAX being super polite, forcing a smile throughout the horrible screening process and being grumpy and tired like we often are in that kind of environment. While I have come to accept that as my reality, I am beginning to reach an age where I realize that just because I have adjusted to my environment does not mean that the environment is acceptable. We have come a long way, and continue to progress, but there is more room to grow. I am proud to be a citizen of a country in which I am able to live a good life and still expect more. This is where sports has such a strong impact. The transition from being the quiet kid that didn’t know how to relate to anybody, to who I am today, is fueled 100% by my love of sports. Sports transcends age, gender, ethnicity, and sexual orientation. Because in the moment we are talking about sports that is all we are, sports fans. I’m proud to be such a diehard fan of the NBA because they continue to show leadership in their tolerance for everybody, moving far faster than American society as a whole. There are more barriers that exist, though. I don’t believe that anybody who looks like me can be elected President of the United States. I never looked at that as any form of discrimination, I just accepted it as an implicit fact. THIS is the next level of progress. Why was the election of Barack Obama as President such an important moment? We’ve had African Americans in high cabinet positions, as powerful CEO’s, etc., but being President? There was no way; that was just accepted as fact. That’s why the symbolism of President Obama is so important, it gives African American kids that are born in 2008 and beyond one less perceived barrier to progress. Now, Sim Bhullar. Never in my wildest imagination would I have thought that the sport I love could actually have a player of a very similar background to mine. I had family friends – who didn’t follow sports – eagerly circulating stories of the Bhullar brothers making noise in high school and potentially playing in Division 1 colleges, but I still never fully bought in. When Sim caught the attention of “basketball twitter” during the tournament, I was finally excited, and I realized that nobody was talking about Sim because of his ethnicity, they were talking about his basketball credentials on the court and his mutant height. Now, I was intrigued. When Sim left New Mexico State to enter the NBA Draft, most experts noted that it was too early and he would most likely go undrafted, but at this point I was hoping for the best. I waited and waited and waited, but 60 picks later Sim wasn’t picked by any team, and I think they probably made the right basketball decision. At this point, I was still very thankful. Sim told me that a player of Indian ethnicity could even be considered for the NBA and that was great. Then the news hits about him being called up from the Reno Bighorns and the reality sets in. Sim Bhullar, whose dad looks like my dad, is about to put on a jersey that Demarcus Cousins wears. I’m going to be able to tell people at my local sports bar that I go to that Sim Bhullar, a guy who grew up like me, made it. And if I was born today, being an NBA player is officially on my list of things that are possible for “people like me”. Thank you, Sim Bhullar. Thank you, Vivek Ranadive (the NBA’s first Indian-Born Owner). Thank you, NBA. I think the whole month of Linsansity speaks to the same point. “We”, meaning middle-class to upper middle-class asian kids, finally saw a guy who realized this intangible dream we all had to some degree. Lin was shirking the stereotypical routes (doctor, engineer, lawyer, business) and chasing after being a professional basketball player. Relatability is so important. In the same way that we can relate to Bhullar’s upbringing, we could relate to Lin’s upbringing. That makes you want to root for them and see them succeed, because in a small way you too are succeeding.